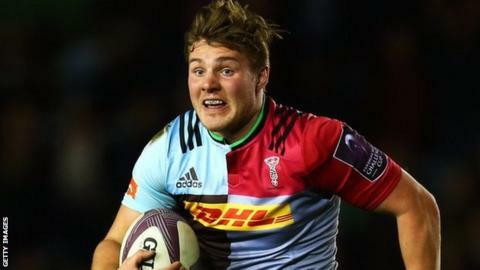 Harlequins centre Harry Sloan has signed a new contract with the club, the length of which is undisclosed. Sloan, 21, made his Premiership debut in March 2014 after coming through Quins' strong academy. "I'm very happy and excited to have committed to the club. We are in a very good place and the future of our squad is really bright," he said. "I'm looking forward to continuing my development by learning from those around me." Sloan was part of the England squad which won the Under-20 Six Nations in 2013, before winning back-to-back Junior World Cup titles. "He is playing the best rugby he has played for Quins and has shown that he can play at the highest level," said the club's director of rugby Conor O'Shea.